A recent Equality and Human Rights Commission (EHRC) Inquiry highlighted the chronic shortage of accessible and adaptable housing available for disabled and older people. The EHRC called for urgent action to address this shortage including: building homes across all tenures to Lifetime Homes standards, 10% of all new houses to be wheelchair accessible, improving the adaptations system and development of more and better accessible housing registers. 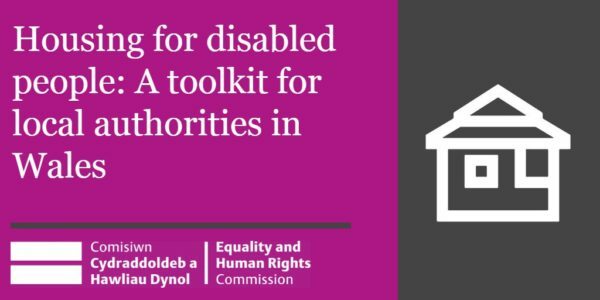 Today sees the launch of a toolkit aimed at assisting local authorities in addressing the issues highlighted by the inquiry – developed for EHRC by Tai Pawb in partnership with Access Design Solutions. The toolkit, entitled ‘Housing for disabled people: A toolkit for local authorities in Wales’ is aimed at local authority councillors in Wales, particularly those involved in housing and planning. The toolkit will assist local councillors in their scrutiny role, as well as in their role as cabinet members and their front-line capacity. It includes practical questions that can be asked in scrutiny committees focusing on areas such as housing and housing related strategies and plans, housing development, planning, accessible housing registers, adaptations, private sector, and support. Parts of the toolkit can also be used by housing association board members in their roles. Accessible housing is fundamental to the realisation of disabled people’s right to independent living. A very wide range of stakeholders contributed to the development of this toolkit and our aim was to make it as practical and usable as possible. I am pleased to see that some local authorities already expressed an interest in embedding it into the work of their housing and housing related committees and we have seen similar interest from housing association boards. Tai Pawb is looking forward to continuing our work with local authorities on improving the provision of accessible housing in their area. If you would like to discuss how to embed the advice contained in the toolkit into the work of your local authority or organisation, you can contact us on 029 2053 7630 or email info@taipawb.org. Read why Accessible Housing means so much to Mark.